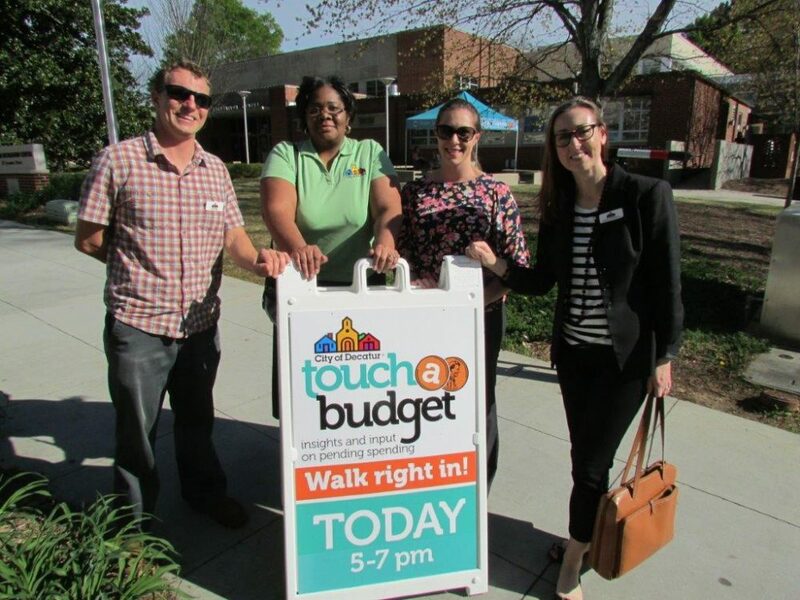 The 2016 ‘Touch the Budget’ event held to encourage community input and involvement in Decatur, Georgia. Photo courtesy of Meredith Roark. In turn, citizens are skeptical about the virtues, capabilities, and good sense of their public officials. People are used to having choices in every other aspect of their lives—what to buy, where to live, how to earn a living—but there are few choices they can make in the public sector, other than which of two candidates to pick in each election. In the U.S., the level of trust in government has reached the lowest point on record. The official, conventional processes for public engagement consist mostly of boring meetings in which citizens are given only a few minutes at a microphone to complain to their public officials. These meetings are almost completely useless for overcoming the divide between citizens and government; in fact, they seem to be making matters worse. The mismatch between what citizens expect and how governments operate is wide. For the most part, our political systems are still republics, not functioning democracies. But over the past three decades, some governments have pioneered new processes, formats, and structures for engaging the public. The innovations that have emerged in recent years include intensive face-to-face deliberations, convenient online tools, and “high-impact volunteering” initiatives that tap the potential of citizens to solve public problems. Many of these innovations satisfy the fundamental needs and goals of citizens, illustrating the potential of public engagement for making difficult decisions and addressing formidable challenges. So far, these kinds of efforts are the exception rather than the rule. On the whole, the principles and practices they demonstrate are not deeply embedded in the ways that governments and communities operate. … some governments have pioneered new processes, formats, and structures for engaging the public. The innovations that have emerged in recent years include intensive face-to-face deliberations, convenient online tools, and “high-impact volunteering” initiatives that tap the potential of citizens to solve public problems. Transparency—not just making government information and data available to the public, but the extent to which that information is presented in ways that make it easier for people to absorb, understand, and act on it. Public work—opportunities for people to work together, with the support and recognition of government, to solve problems or seize opportunities to improve their communities. -Decisions that individuals and families can make about how they want their public services delivered and how they want public information provided. -Decisions that citizens can make collectively on critical issues like education, budgets, planning and land use, public health, and public safety. -Talk about why they care about an issue or policy question. -Learn the facts they need to make informed decisions. -Figure out what values they share, and how those should be reflected in policies. -Find common ground among differences of background, ideology, and opinion. -Decide what they want to recommend to policymakers. -Decide whether and how they want to take action to implement their ideas. Employing these small ‘d’ democratic practices as part of standard government operating procedures can be transformative. In countries and communities that have more participatory forms of governance, citizens are more likely to trust government, trust their neighbors, and pay their taxes. Governments are more likely to complete planned projects and manage public finances efficiently, and have fewer incidents of corruption. Finally, there is another promising way to build government legitimacy, one that is frequently overlooked because it is a quality we tend to associate with community rather than government. When people come together regularly to socialize, form relationships, and feel like they belong to something—and if the people in those settings feel like they can interact with government in some meaningful way—then the society as a whole seems to have a greater sense of confidence, well-being, and trust in public institutions. The political philosopher Hannah Arendt once remarked, “Democracy needs a place to sit down,” and that sentiment may be even more true today, even though these gatherings may now be online networks and not just face-to-face meetings. Whether and how people get together may seem more like a private matter than a government concern. But some of the best examples of thriving local democracy have come about because public officials helped to support, connect with, and learn from citizens meeting in community centers, schools, bars, restaurants, and online. The city of Decatur, Georgia has found creative ways to include the community, from a Budget Expo, complete with ‘Touch the Budget’ and Budget Bingo, to hosting “Budgets and Beer” nights at a downtown bar, where city employees brought poster boards to help explain public finance issues and surveys to gather citizen input. “Meet and Eat,” a weekly lunch in Buckhannon, West Virginia, has helped citizens plan and establish a new farmer’s market and new bike trails. The residents and employees of Jun, Spain, use Twitter to communicate about everything from streetlight replacement to matters of EU policy—along with advertising social events, booking doctor’s appointments, and finding lost pets. The Brazilian cities that first began organizing Participatory Budgeting over twenty years ago made it work in part because the process has always been highly social, regular, and sustained (PB is now one of the most widespread democratic innovations, having reached over 3,000 cities worldwide). In all of these places, engagement works because it meets a diverse array of people’s needs. These cities have succeeded because they pulled the social world and the political world closer to one another, showing how governance can become more congenial, more rational, and more fun. For decades, we have clung to a political system that provides basic human rights, the opportunity to vote for our representatives, and little else. All over the world, this limited form of democracy is losing ground to authoritarian rulers. To establish trust and legitimacy with citizens, the next democracies must embody a better understanding not only of what citizens want, but of what citizens can contribute to government. Matt Leighninger, vice president of public engagement at Public Agenda, is the author, with Tina Nabatchi, of Public Participation for 21st Century Democracy.